In Fundamental British Values in Education: Radicalisation, National Identity and Britishness, Lynn Revell and Hazel Bryan explore an area in which particular conceptions of Britishness have been promoted: namely, the education system. Focusing particularly on the role of schools in counter-terrorism policy, this well-researched study shows how government influence has extended from defining British values to active interference with the school system, writes Benjamin Law. Fundamental British Values in Education: Radicalisation, National Identity and Britishness. Lynn Revell and Hazel Bryan. Emerald Publishing. 2018. In recent years, Britain has been in political flux, and as such, questions about British identity have come to the fore. From the hazy summer of 2012 when the Olympics were held in London, through the Scottish independence referendum to Brexit, the question of what it means to be British in the twenty-first century is being debated, and there is still a long way to go before that question is answered. The time is ripe, then, for an academic interest in the notion of ‘British values’. 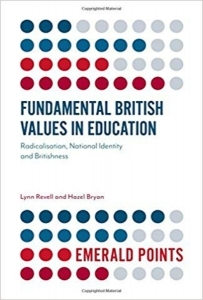 Fundamental British Values in Education: Radicalisation, National Identity and Britishness, authored by Lynn Revell and Hazel Bryan, gives insight into an area where Britishness has been persistently promoted and yet is often overlooked: namely, the education system. The UK education system is an obvious area for an investigation into British values. Schools are often the first places where we come into contact with the public sphere and learn cultural values outside of the family unit. As such, teachers play an important role in conveying the cultural norms and values of a society to future generations. Revell and Bryan argue this point; however, they go further by asserting that the education system has become a tool at the forefront of the UK government’s attempt at instilling ‘British values’, something which, they argue, is unique in the history of the British education system. 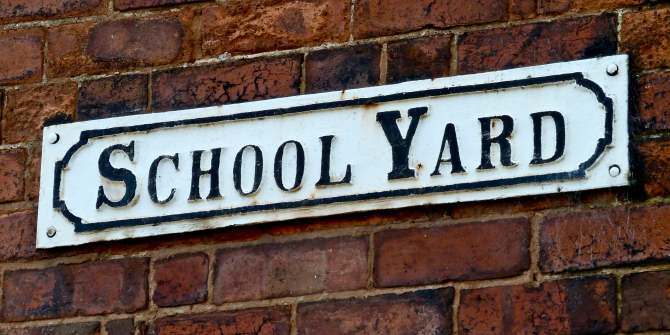 Once, schools had a degree of autonomy from government interference. Now, schools are being deliberately used by the government, and we have arrived at a situation where the roles of the state and the individual have become blurred. Teachers have gone from being professionals with autonomy to educate children to agents of the state and its attempt to construct a brand of Britishness devised by government policy. With their investigation into British values in schools, Revell and Bryan paint a convincing picture of what is therefore at stake in the modern education system. To illustrate the change that has occurred in the last twenty years or so, Revell and Bryan first describe the evolution of teaching British values in the education system over the previous century. Far from being a digression, this underlines the point that values are remarkably arbitrary things which are relative to time, place and government agenda. During the twentieth century, schools went from teaching British values based on the racial superiority of the British and their imperial destiny to those grounded in pro-monarchism and equality. After World War II and in order to smooth the process of immigration from the dwindling ‘empire’, the education system focused on assimilating the children of immigrants by teaching certain values in schools. Yet, whilst Britishness was ostensibly promoted as being open and liberal, at heart it was still monolithic – based on being white, and more often than not discriminatory. For example, while schools took measures to ban racial discrimination, there was always an element of discrimination based on other factors. As the authors argue, by the 1970s black and Asian children who did less well than their peers were to be considered ‘deprived not because they were black and Asian but because they lived in poverty or because they did not speak English well enough’. However, the most striking point is left until the end of the second half of the book where the authors show how the government’s influence has moved from defining British values to actually interfering with the school system, thereby breaking down the autonomy of schools and teachers and turning them into wings of government policy. Revell and Bryan leave the reader in no doubt as to why this has happened: ‘The origin of fundamental British values is rooted in a positioning of radical Islam as a threat to liberal democracy.’ A 2011 speech by the then-Prime Minister David Cameron signified a move away from open tolerance of differences between communities to a ‘muscular liberalism’, which positively seeks to promote a set of values in the public sphere that are distinctly British. Muscular liberalism has little time for those who threaten these values and one group in particular is identified: Islamic extremists. What is perhaps most startling is that the new form of liberalism, as promoted by politicians such as Cameron and Michael Gove, sees no problem with making schools into battalions against the threat of extremism on the streets. As a result, a ‘trinity’ of government policy initiatives was released, making the classroom a front line in the fight against ‘extremism’: namely, Teachers’ Standards in 2011; The Prevent Duty in 2015; and the Counter-Terrorism and Security Act in 2015. In the words of the authors, the latter firmly requires teachers ‘to promote fundamental British values inside and outside the school’. The aim is to prevent pupils from being drawn into radicalisation or terrorist activity, and to have the expertise to know when a pupil is experiencing radicalisation. Revell and Bryan apply the term ‘Liquid Professionalism’ to illustrate a situation whereby the distinction between private and public spheres is blurred. They dedicate a chapter to show how ‘liquid professionalism’ has specifically broken down the boundaries between teachers and the state. This has led to a situation whereby ‘the teacher is positioned as a key player in a British counter-terrorism policy’ or, more worryingly, as ‘the eyes and ears of the state’. British values are deemed to be liberal values, argue the book’s authors; and yet such government action presents a problem for liberalism itself. Liberal thinking values the individual and the ability of the citizen to form their own beliefs. Yet, schools and teachers are now expected to influence the private sphere and teach values defined by the state. The reader is left with the question of whether the government should have such influence over defining values and, at the same time, their promotion in the public sphere. Revell and Bryan present an interesting and well-researched narrative on the evolution of British values in the education system over the past century up to the present day. However, the depiction of the increasing role of government in the book is what draws the reader’s attention the most. There could have been more detail about how the curriculum has been changed to fit the new ‘muscular liberal’ values. Providing insight into the teaching materials given to teachers and the content pupils are expected to learn would have given the reader a better sense of how far the government has a monopoly on what is being taught in schools. That said, the authors succeed in their aim to show how susceptible to change British values are, and how the government has succeeded in redefining the role of the education system in promoting the state’s agenda. In short, Fundamental British Values in Education is an apt read at a time when the debate over Britishness has never been so charged.